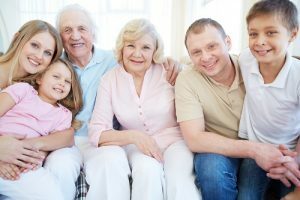 When an unexpected accident, or an illness comes on suddenly, you might find yourself in the unfamiliar role of caregiver to a family member of loved one. If you’ve never been in that situation before, you’ll soon find out that it’s a complicated and time-consuming process. It may include driving your loved one to doctors’ appointments, grocery shopping & preparing meals, paying the bills, dealing with insurance companies, finances and more. This can be a stressful time for a new caregiver and you might feel overwhelmed at first. There are ways, however, to make the process easier for everyone involved. The first step starts with communication. While some of the communication might be difficult at first, you need to know how your loved one feels and understand what they want and need from you. Discussions like these are even more effective if you have them before something unexpected actually happens. No one wants to feel helpless, so at first your loved on might resist your offers of assistance. Patience is important at times like these and if it helps, bring another family member or medical professional into the conversation. Your loved ones need to be respected and their concerns and wishes need to be listened to as much as possible. They need to be part of the decision-making process to help them feel more in control of their situation. Depending on the situation, it may be important to discuss insurance and more personal information such as finances. If you’re a caregiver to a family member, you’ll need to know how home finances will be taken care of as well as medical bills. When communication is open an honest, the process of caring for you loved one will be made that much easier. If you have any questions about caregiving, call us. Do some research so you can know as much as possible about how to best care for and help your loved one recover. You can find information online as well as consult with your doctors. Some recoveries take weeks, months or even years and it’s best to know what to expect. Don’t try to do it all alone. If a loved one is ill or has been seriously injured, your initial reaction might be to take the caregiving on all by yourself. That means that on top of managing your own life, you will need to arrange doctors’ appointments and drive them to those appointments. Caregivers need to help manage medications, prepare meals, keep the house clean and assist with the daily needs of living like bathing and grooming. If the accident was the result of someone’s negligence, you may also need to deal with attorneys and insurance companies. It’s just not possible or healthy for one family member to do it all. It is impossible to do this all on your own. Get a team of family members, friends and seek the assistance of a professional caregiver. Check out local support groups for caregivers. As a caregiver, you need to take the time to restore yourself or you will eventually feel overwhelmed and run down. Learn to know your limits are and stick to them without guilt. When you take care of yourself, you will be a better caretaker for your loved one. When a situation like this arises and you find yourself caring for the needs of an injured family member, it can be uncomfortable at first. No one wants to be bathed, fed and dressed by a family member or friend. It is important to communicate and build trust with the person you’re caring for. This can be a frustrating time for someone who can no longer care for themselves. Listen, show compassion and understanding, and be patient. Take their mind off their condition by playing a game or watching a movie or even going through old family photo albums with them. If you are caring for someone and they ask for confidentiality, respect that. That includes any medical information that has been shared with you. When you’re caring for a family member, don’t forget the needs of other family members living in the house. Your children and spouse need you too. Make sure you take time to appreciate them. Be an advocate for your family member. If you feel that progress is not being made or notice a change in mental or physical health, discuss it with them and their doctors. Don’t try and do everything for them. If they up to participating in their own care, let them. Being more active in their everyday tasks, will help them gain confidence and recover more quickly. Check to find out what services are available in your area to help make life easier. Meal delivery programs, doctor appointment transportation services, local in-home health care services can be life-savers. Many of these vital services may be partially covered by insurance or will scale their rates based on ability to pay. Last but not least, take care of yourself. Eat balanced meals, get enough sleep, exercise, socialize with family members and friends, and treat yourself to something you really enjoy. If you find yourself overwhelmed, fatigued, anxious, worried, unable to sleep, sad or not feeling well, remember, there is help. We at Adele’s Caring Angels Caregiver Service are caregivers too and have also been caregivers to our loved ones! Remember, we can stand together and be strong for the benefit of your loved one and family. How Do you Know if Your Loved One is Suffering from the Early Stages of Dementia or Alzheimer’s? Everyone forgets things from time to time and wonder if we’re losing our memory. In most cases, it’s completely normal to have memory lapses. However, senility, age related dementia and Alzheimer’s disease are serious issues for the elderly and the people who care for them. 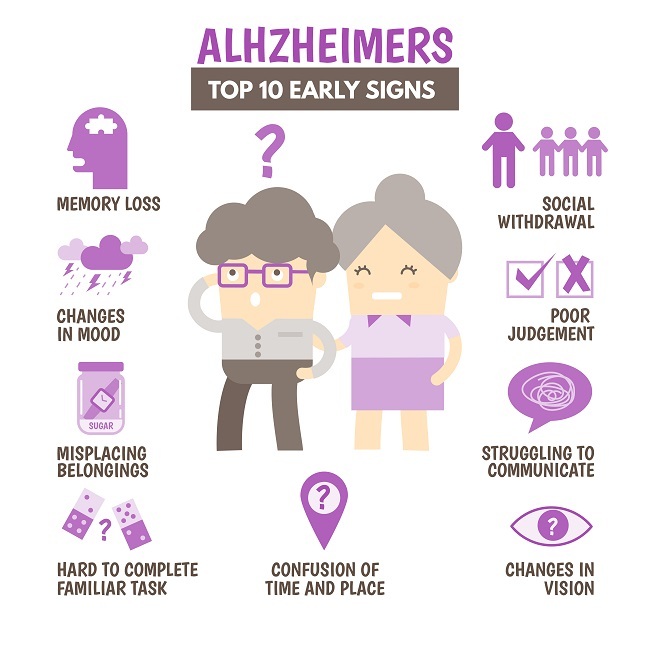 Below are some of the signs and symptoms that can be cause for concern according to the Alzheimer’s Association. Your loved one may not be exhibiting all of these symptoms in order for them to seek medical advice. Additionally, there are other factors that can lead to some of these symptoms which include medications, depression, alcohol abuse, vitamin deficiencies, dehydration and medical conditions. Misplacing things. We all misplace our car keys or wallet from time to time but when a person puts those things in the wrong place, such as in the refrigerator, this can be a first sign that there is a problem. Memory loss is another common symptom that should be addressed, especially if they don’t eventually remember what they forgot. Another sign is if they keep asking you the same question without realizing that they just asked you that question. Not Realizing where they are. Patients may wander off for a walk get lost in their own neighborhood. They may forget how they got there, or more seriously, what time it is or how to get back home. Difficulties with language or forgetting their words not only makes it difficult to communicate but can lead to frustration and anger for someone suffering with memory loss. Being easily distracted. A person with sings of dementia may inadvertently do something dangerous to themselves of someone in their family. for example, leaving food cooking on the stove top and leaving the house or going to bed. Moods wings and personality changes can be a symptom if a person goes from one emotion or behavior to another for no apparent reason. Forgetting how to do things or losing the ability to do abstract thinking. A person showing sign of this might go to start the dishwasher, but forgetting how, or wanting to open a can, but forget which tool to use. If you or a loved is experiencing and of these troubling symptoms, visit a doctor as soon as possible to determine the cause. Remember, some of these symptoms can be caused by factors not related to dementia and can be reversed. Regular exercise provides a number of important health benefits for just about everyone, including older adults. Staying fit and active can lower blood pressure, reduce the risk developing diabetes, osteoarthritis, osteoporosis, improve cognitive function and improve lipid profile. It has been shown that regular physical activity can even decrease age related morbidity, yet the vast majority of older adults don’t get the exercise they need to enjoy the benefits of a more active lifestyle. Almost anyone, at any age or with any health condition, can participate in some form of exercise, even if it’s the simplest of movements. Physical exercise basically consists of strength training, aerobic activity and activities that improve flexibility and balance. Family, friends, physicians and caregivers all play a vital role in making sure our aging loved ones are getting enough exercise. Regardless of physical and health related limitations, there are safe effective ways to improve health through physical movement. Caregivers can help motivate and encourage the elderly by providing options that are fun, rewarding and easily achieved. As with any exercise program for anyone of any age, a physical exam is recommended to determine any risk factors that could influence the types and intensity of a person’s work out program. For someone who hasn’t exercised in a while it is also important to begin gradually, avoid overdoing it, dress appropriacy, and increase frequency and repetitions over time. Exercise should become a habit and part of a daily routine to be effective. With encourage from caregivers, physical activity can promote a healthier positive self-image and attitude and improve quality of life. While being in cold weather can’t give you the cold or the flu, it can still cause very serious health problems. 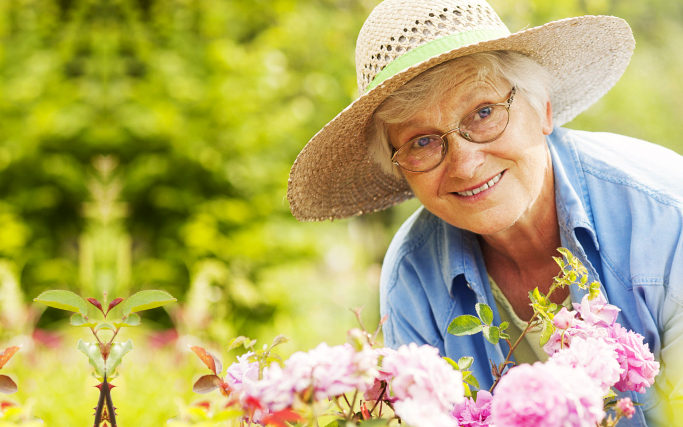 Older adults can lose body heat fast. Some of the changes that come with aging may make it harder for people to be aware that they getting cold before it’s too late. Hypothermia is a dangerous condition that can come on very quickly. Hypothermia is a condition that occurs when your body temperature gets too low. While a younger person may be able to tolerate colder temperatures, an older person’s body temperature should never drop below 95°. Health problems that can result from becomingtoo cold include such things as heart attacks, kidney problems, liver damage, or even death. 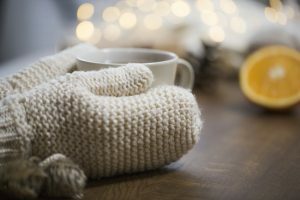 Hypothermia can happen to our elderly whether being outside in the cold or even inside their house or nursing home where the thermostat is set too low. If you are caring for a loved one, help them avoid cold places and pay attention to how cold it is where they are living. Elderly people are often on a fixed budget and may set the temperature to low in an effort to save money. It is recommended that home temperatures be set no lower than 68 degrees. It is also important to dress appropriately, even indoors. Elderly people who are sick or suffer from chronic conditions like diabetes, thyroid problems and arthritis are at an even higher risk of developing hypothermia, and those with Alzheimer’s or memory problems may forget to dress properly when they go outside. Additionally, some medications can affect a person’s ability to retain body heat. If you have an elderlyfamily member, neighbor or someone you’re caring for, make sure they are keeping their home warm enough and that they are dressing for the weather. Encourage them to eat well and keep up their body weight. Drinking alcohol should be kept to a minimum as it can contribute to the loss of body heat. If there are power outages, help get them to a safe and warm place until heat is restored. Early signs of hypothermia can include cold feet and hands, pale skin, shivering, slow or slurred speech, puffy face, fatigue, confusion, clumsiness, slowed heartbeat, and shallow breathing. If you suspect you or someone you care for is showing signs of hypothermia, call 9-1-1 immediately. If you’re the caregiver, friend, neighbor or family member of an elderly loved one, it’s important to understand that the holidays can be a difficult time for them. The elderly often suffer from loneliness, depression and may be mourning the losses they’ve experienced over their lifetimes. And while the holidays might be a time to reflect, it can also be a joyous time to share with friends and family. One of the most important things you can do is listen to them. Let them share their stories and if they are feeling sad, allow them to share those feelings. Show empathy, remember, at some point in the future you may be in the same place feeling the same feelings. Encourage them to remember the good times in their lives, focusing on happy memories as well as those that make them feel sad. Make them an important part of your holiday celebration, show them that they are loved and appreciated and useful member of your family. No one wants to feel useless or like a burden to their loved ones. While caring for an elderly family member, loved one or a neighbor can be strenuous, never let your words or actions make them feel like they are a burden to you. Elderly people may find it hard to keep up with lifelong friends or family members. Help them write holiday cards or letters as a way to reach out to the people they may be missing or worried about. If possible, help make phone calls as a way to connect with the people they haven’t spoken to in a while. Help them decorate their home or room, using ornaments or decorations that have meaning to them, whether it’s for Christmas or Chanukah or another holiday, being surrounded by festive decorations can be uplifting. And while decorations may put people in the holiday spirit, let your loved ones know that it’s the connections we have with people that mean the most. If you have elderly neighbors or relatives that live alone, bring them some holiday cookies, treats or drop off a meal. Make sure they have something to do for the holiday. If not, invite them to celebrate the holidays with you. For those who can’t be with their elderly loved ones during the holiday because they live far away or are in a nursing center, make sure you check in with them to make sure their needs are being met. You can check in with their caregivers or assisted living centers and find out what they have planned for those spending the holidays alone. Sending a care package with gifts and other goodies can go a long way towards easing loneliness and depression over the holidays. Spending time with them is by far the most important thing you can do. Share a meal, make holiday cookies with them, look through old photo albums, enjoy some home movies and memories of the past, play holiday music or watch a classic holiday movie together. Your time is the most important and precious gift you can give your elderly loved ones this holiday. Shang time with the people you care about is not only important to them but will create lasting memories you will cherish for the rest of your life. The journey in caregiving comes with a sacrifice of oneself when giving care to your loved one. The routine that we’re used to following comes to a halt. Some of us have jobs and families to tend to daily. Now, there is another responsibility that must be included in our daily lives. “What am I going to do”, is the question that comes to mind? Watching our parents from the time we’re born to the day we realize that they to need our assistance is when we fight within ourselves with the reality of our parents aging. If we sit back and think about when we were growing up, our parents were our caregivers. They assisted us in every way possible. It wasn’t always easy and sometimes they to needed help to make things a bit easier. How many of us thought about what it would be like when our parents began to age? How many of us thought about what we would do or who would be there to assist them when they needed us the most? About 1% have thought about those two questions while growing up, even if we didn’t have a solid answer about what we would do or even if there were other siblings to consider. Stepping into our caregiving roles is a pair of shoes we can not avoid. Sometimes, it can be emotional and depressing watching our loved one decline. We must learn and understand that we must stay strong and positive. We must remember that our loved one is going through a tough time realizing that they’re not as independent any more. Our parents don’t want to bother us, nor do they want to have their daily lives and routine to change. Keep our aging parents safe and independent as possible is key. Keep our loved ones active in their communities. Keep them creative and motivated like choosing what they want to wear, family and social outings. Keep their cognitive abilities activated. If they can speak, read and write there is hope! BE HELPFUL & POSITIVE NOT IN DENIAL! Just because our aging parent was diagnosed with Dementia, Alzheimer’s, Cancer or any other deteriorating condition, doesn’t mean that they’re helpless or hopeless. Limiting their decision-making abilities or treating them like children won’t help them fight the disease. It will only increase the progression of it. If our loved one begins to forget what happened 5 minutes ago or if they see people from the past that have moved on is a sign of confusion within themselves. These are the times, when we need to step in and bring our loved one back to reality. Helping them to remember what happened 5 minutes ago in a calm and welcoming voice. Helping them to remember that the loved one they’re seeing has passed on long ago. Being honest is the best policy! Guilt within ourselves when we witness our loved one decline is when our strength and perseverance is needed the most. We must now have patience and learn what we need to do to keep our loved one Comfortable and Happy. Being Overwhelmed and Frustrated comes with the role as being a caregiver. WE MUST REMEMBER THERE IS HELP! 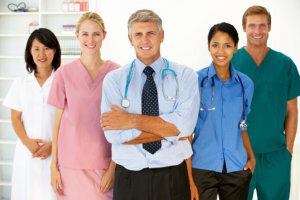 Whether gathering with family members to construct a family care team that can assist with the care of your loved one. Or, to reach out to outside resources that may be able to assist in the care of your loved one keeping them safe and at home. Adele’s Caring Angels Caregiver Service LLC is a Non-Medical and Hospice home care agency that provides personal care services to seniors. Our Mission is to provide excellent care to our valued clients, advocate for their rights, and personify the compassion of a caring angel. Our clients and their families feel cared for and supported. We listen closely, show empathy and respond to the needs of our clients. We provide Non-Medical and Hospice home care to our clients with the highest, professional, ethical, and safety standards. We demonstrate honesty, commitment, and loyalty to our clients and their families. Our clients and their families can rely on us to be on time! We keep our commitments as promised. We at Adele’s Caring Angels Caregiver Service LLC are caregivers too and have also been caregivers to our loved ones! • Start by having open communication with the person you’re caring for. Find out what their wishes, needs and expectations are. • Learn as much as you can about your loved one’s conditions so you can understand better what the prognosis is and how to help with treatments, pain management and medications that may be needed. • Make and keep a list of medical providers contact information close by so if you have any questions or concerns, you can get answers quickly. • Caring for a loved one requires spending a lot of time with that person. Find out what they like to do and spend quality time together. Perhaps even have some fun together. • Keep in mind that if you have a job, you may qualify for a temporary leave of absence through the Family and Medical Leave Act (FMLA) which could allow you up to 12 weeks of leave without worrying about losing your job. • Determine if there are certain things you will need outside assistance for. Your loved one may prefer a trained professional for bathing or other personal needs, rather than a family member. • Make a list of friends, neighbors or family members you can call on to give you a break if you need to attend to an errand or just get some time to yourself. In addition, local churches, hospitals, senior and community centers may offer assistance through their volunteer programs. • Take care of your own health. Eat right, exercise and get enough sleep and don’t skip your regular medical checkups. As a caregiver you may face a host of new roles and responsibilities which, at times, can feel overwhelming. While the role of caregiver can create new challenges, it can also be very rewarding for both you and your loved one. People are living longer as medical treatments advance, and as a result, more of us are living with chronic conditions and in need of assistance. Today, more and more of us find ourselves becoming caregivers to our elderly spouses, siblings or parents. The love and care you give to those who depend on you is a gift you may be willing to give yet feel totally unprepared for. With help and resources available to caregivers, you don’t need to be a nurse or doctor to help improve the quality of life for your loved one. While it may not be easy to ask for help, professional services are there to help you if you need it. If you’re in a situation where you’ve become a caregiver for a loved one, call Adele’s Caring Angels Caregiver Services at 313-414-0065 with any questions you may have. At Adele’s Caring Angels Caregiver Service LLC, we take the time to fully understand the needs and situation of every client that we service. We use this understanding to prepare and deliver a comprehensive and personalized care plan that is unique for every client and their family. 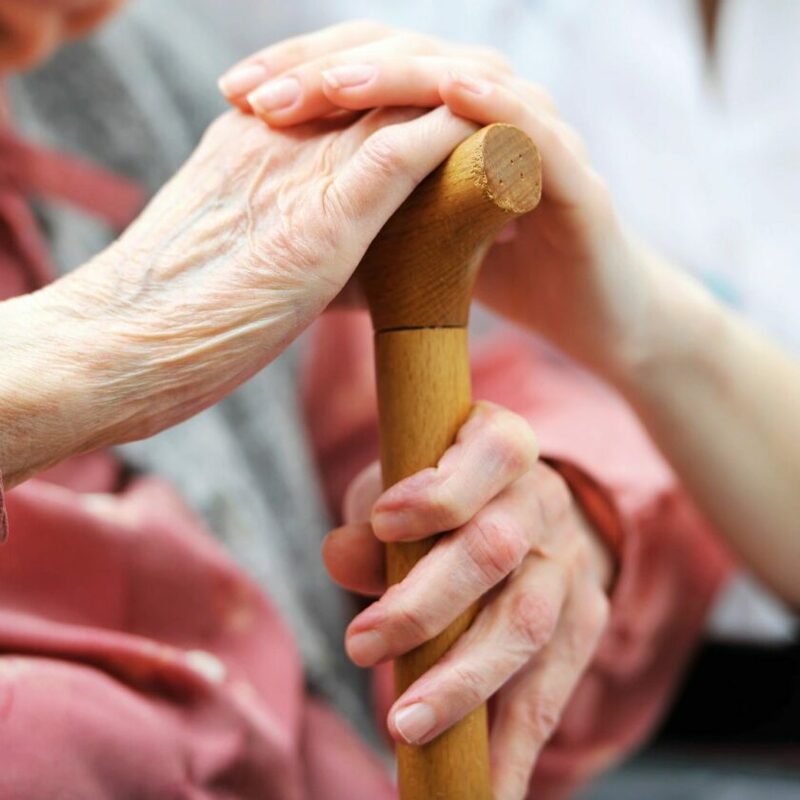 For anyone who has an elderly loved one, nursing home neglect is a real concern. As many as 95% of residents in nursing homes or long-term care facilities report some forms of abuse every year. The severity and types of elder abuse range from neglect, where basic needs are not being met, to actual willful abuse where a caregiver causes physical harm or injury. Finding a caring trustworthy nursing care facility can be daunting and loved ones may not even know what constitutes neglect or abuse. If a facility or caregiver fails to care for the medical needs of a resident the consequences can be severe. Caregivers must make sure residents are getting their proper medications, assist those with mobility issues and provide food, water and a clean environment for people in their care. Neglect can lead to infections, bedsores, mal-nutrition and more. In additions to basic medical care, caregivers must provide adequate assistance with bathing and personal hygiene needs, and provide emotional support. It is not uncommon for staff members to ignore elderly residents, leaving them isolated and alone for long periods of time. If your loved one is being neglected, it might not be obvious to detect. Symptoms of caregiver abuse can be very subtle. 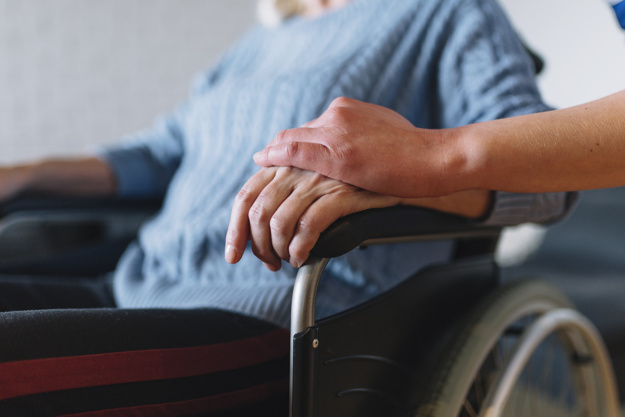 Many nursing home patients don’t see loved ones on a regular basis and those who do, may not be able to communicate their abuse to their visitors. If you have a loved one in the care of a nursing home, assisted living facility, or being looked after by a caregiver, here are some things you can look for to detect abuse and neglect. Unfortunately, the elderly who are living with neglect or abuse by a caregiver are at greater risk for significant illnesses, infections, depression, loneliness, injuries and even death. It is the responsibility of the nursing home or care giver to provide adequate care, and for those with higher risk, additional care is essential. Caring for the elderly or those who can no longer care for themselves without assistance needs to be a shared effort between caregivers and loved ones. 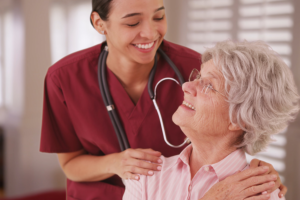 Many times, nursing home facilities are understaffed and good caring employees can be hard to find. Studies suggest that those in need of assisted living fair much better when they have frequent friends and family that visit and are less likely to suffer neglect or abuse. Do you, or a loved one, require assistance with activities of daily living? Do you need extra help with household chores and other housekeeping tasks? Are you in need of supportive hospice assistance? Whether you need assistance on an hourly basis, or if you are looking for 24/7 support, Adele’s Caring Angels Caregiver Service LLC. is here to meet your needs. At Adele’s Caring Angels Caregiver Service LLC., we provide comprehensive non-medical home care services that are delivered by highly trained and compassionate caregivers. We take the time to understand your situation, and from there, we provide you with the personalized services and support that you and your family need. Make sure you take good care of your own health so that you can be strong and healthy enough, both physically and mentally, to properly care for your loved one. The best way to successfully help your loved one, is to be the best you that you can be. Caregivers , like yourself, need to pay close attention to any physical and emotional issues that they may be experiencing. As a caregiver, you need to try and avoid feeling overwhelmed, burnt-out or simply exhausted. When this happens, you can reduce your body’s immune system making it more difficult to fight off illness and disease. Am I feeling depressed or lonely? Do I feel more tired than usual? If I got a cold or flu, who would take over my duties for me? If I do get sick, will my loved one catch it from me? Do I need a break, or at least some help? It’s vital that we all create a healthy balance between our responsibilities to others, and our responsibility to ourselves. There are a number of things that can help caregivers feel better, happier and healthier. Make sure you get some form of exercise every day; a walk, a trip to the gym, a bike ride, or whatever you enjoy. Exercise is great for you body as well as your mind! Don’t forget to take a daily vitamin supplement. Ask your doctor or pharmacist which supplements might be right for you. Visit your doctor for regular medical exams and if you have symptoms of an illness, give your doctor a call. It’s okay to take a break from your caregiving duties. Make sure you take time off for yourself. Go out with friends or family. Have some fun and relax. Get a flu shot and stay up to date on any other vaccines you are due for, such as pneumonia, tetanus and shingles. If you’re feeling depressed, talk to someone. Adele’s Caring Angels Caregiver Service LLC. seek to provide excellent non-medical home care to our valued clients, advocate for their rights, and personify the compassion of a caring angel. Remember: Caregivers should always stay up to date on their CPR in case of emergency.